Below you’ll find eight motorcycle maintenance tips that will keep your vehicle in the best shape possible for the benefit of yourself and other motorists on the road. The primary functions of motorcycle oil are to act as a lubricant, reduce engine noise, keep other parts of the engine cool, and act as a seal for the pistons. It is important to check the manual to find out how often you need to change the oil; however, on average it should be changed every 3,000 miles. It’s important to check the air pressure in your tires and look for signs of wear and tear frequently. Having the right tire pressure will allow for better handling on the road, help to avoid blowouts, and extend the lifetime of your tires. Prior to each time you ride, it’s a good idea to test the brakes to ensure they’re in good working order. You’ll also need to check the brake fluid level and replace it depending on what your manual says. Keep an eye on the brake pads and replace them well before they get down to the metal. Choosing the proper fuel for your motorcycle is vital to its overall operation. Be sure to use the recommended fuel to improve your motorcycle’s performance and longevity. The spark plugs are essential to the motorcycle’s overall performance. If you need to remove the spark plugs, make sure you use an air compressor to remove any dirt and debris that could fall into the engine. The drive chain transfers the power from your engine to your rear wheel. If the drive chain isn’t lubricated properly, the consequence can be deadly. 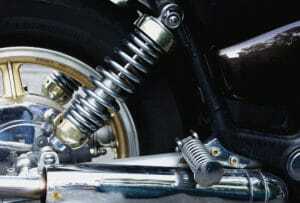 It’s good practice to lubricate the chain with oil after operating the motorcycle so that chain is still warm. If your air filter is dirty, the motorcycle’s engine will worker harder. Cleaning it with an air compressor or replacing it will give the vehicle more power. You may want to consider purchasing a trickle charger to extend and preserve your battery life. Try to avoid leaving your lights on and store the vehicle properly in the off-season. In 2016, nearly 5,300 motorcyclists were killed in motor vehicle accidents. Some of those accidents can be attributed to improperly motorcycle maintenance; however, others were due to other negligent, unaware drivers. If you’ve been injured in a Kentucky motorcycle accident you have legal options that may help you recover financially from the accident. Our Lexington, KY motorcycle accident lawyer is prepared to help you understand your case and answer any questions you may have. Contact our law firm today for a free consultation.